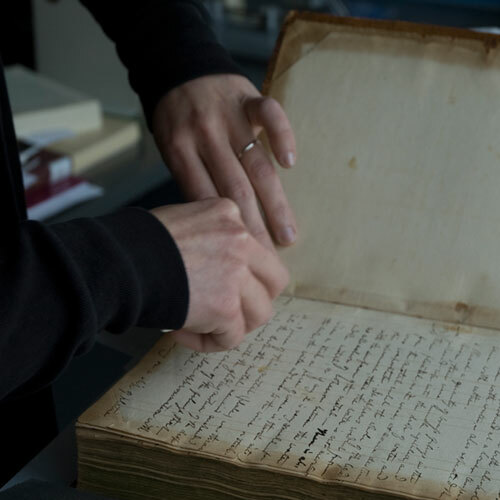 During her tenure at the Archives, Kirsten performed conservation treatments on Smithsonian collection materials in the Smithsonian Center for Archives Conservation’s lab, and helped with the preventative care of our collections to ensure the long term usefulness of the Smithsonian’s resources. Wilson “Snowflake” Bentley’s beautiful photographs of snow crystals from RU31. I am fascinated by the pioneering process in which he captured individual snowflakes, standing in the cold for hours so the snowflakes would not melt and using a feather to delicately place each snowflake under the microscope lens! You can read more about how he photographed and revolutionized our understanding of snowflakes in Stories from the Smithsonian: William A. Bentley-Pioneering Photographer of Snowflakes.